New Coaches Poll: 1.Ohio St 2 MichSt 3 TCU 4 Baylor 5 OleMiss… Do these coaches go to sleep at 8 pm ET on Saturdays? Incidentally, Feldman has 231,000 Twitter followers. He is one of many leading the charge to give Utah even more love after their 62-20 thrashing of Oregon on Saturday night. And with those impressive wins, why shouldn’t Utah be in the top five, if not #1 in the country. 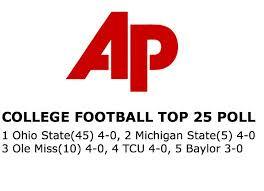 We all know name recognition still matters and that’s why you see Ohio State and Michigan State ranked so high. As well, you can see the carry over effect from last year with TCU and Baylor both in the top 5. I don’t have a huge problem with that for now. However, if Utah keeps demolishing high quality Pac-12 opponents they’d better move up. You’ve got to throw name recognition and last year out the window and just go with who the best teams are right now. I thought it was joke last year when Florida State made the college football playoff. Sure they were undefeated but everyone knew that were not as good as the previous year. The committee got it right by including Ohio State but they should have dumped FSU and put TCU in. The other problem I’ve always had with the rankings (and the playoff committee) is the inordinate amount of sway ESPN has. Too many people just side with whatever ESPN says on Game Day, or whatever company line they feed us 24-7 on Sports Center. ESPN essentially owns the the playoff and the other four New Years 6 games. ESPN has regular season TV deals with the Big 10 and SEC. Imagine that, look who’s #1, 2 and 3. The Pac-12 plays a lot more on FOX. Even look what ESPN has done for BYU this year. The Cougars have a nice contract with ESPN and you’d of thought they were gonna win it all this year after ESPN ran those hail mary plays over and over again. You love it if you’re a BYU fan, but the average viewer is a bit confused why ESPN spent so much time propping up a team that just got drilled 31-0 by Michigan. Anyways, it’s widely recognized that Utah has to continue to fight for respect and rankings. It’s a great thing for Utah and the Pac-12 that FOX is increasing their college football TV presence this year. Bottom line – if Utah keeps winning, they should have no problem climbing in the rankings. That said, I think it’s a bit much to assume Utah will go undefeated. It’s highly likely they lose a PAC-12 game or two but could still win the South Division. And that’s why fans are upset right now. If you’re at #10, and lose to a ranked CAL or USC team, you drop all the way back down to the #18-22 range. If you’re ranked up in the top five and lose a close one, people still recognize you’re very good and you don’t tumble as far.